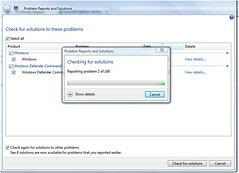 Windows Vista provides problem reports and solutions. That is helpful for people who want to try and fix something now, cheaply. We don’t have to pay for a service specialist or spend hours fiddling in the depths of the control panel. This is quite nice of them. Or is it? All Neverland’s 169 reported problems are atribbuted to Windows rather than other applications. Should I be alarmed by Windows? Or, iIs this because other programs don’t use the Windows problem reporting system or is it because Windows has an infinitely higher problem rate? On planet wendy there are no problem reportsbecause the program causing the problem would receive the report, fix it then make me a cup of tea and compliment me on my choice of frock. This scribble was published on Friday, June 5th, 2009. You can follow any banter on this scribble with the RSS 2.0 feed. You can share your inspired musings after typing the anti spam word near the bottom of the page. But no Pinging because its too naughty. Windows is fundamentally buggy but they want you to believe that they have solutions. I have a book that rewards me for reading a rather technical section by telling me I deserve to go and get myself a bowl of ice-cream.